American pupils are to be allowed to take part in London's 2007 New Year parade after a ban over safety fears was overturned. Florida officials stopped Fort Myers High School pupils taking part over fears of "trains blowing up" in the wake of the 7 July bombings. But organisers protested and pupils' parents overruled the decision on Thursday night, voting 87% in favour. The annual parade attracts thousands of performers from all over the world. 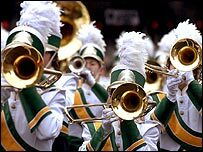 The high school's marching band was to join the 100,000 US pupils who have taken part in the parade over the years. But state officials in Lee County, in south-west Florida, blocked the trip. One official, operations officer Herb Wiseman, was quoted as saying "we don't have trains blowing up in America". It prompted an angry response from parade organisers, who hit back by pointing out Fort Myers had a higher murder rate than London and was prone to hurricanes. Even Florida state governor Jeb Bush said the ban may have been "overly cautious". The Lee County School Board ruled parents should get the final decision. They overwhelmingly backed the trip on Thursday. Band members said they were happy to be able to go to London, but they still need to raise about $250,000 (£142,500) to finance the trip.